The retail industry has undergone a revolution as a result of eCommerce and its associated technologies. To a large degree, this transformation has negatively impacted physical stores that have tried to compete with less expensive and more convenient online retailers. Meanwhile, many of the major traditional retailers have expanded their online offerings but frequently struggled to compete against the leading pure-play eCommerce innovators. However, there have been several recent technological developments that are both re-imagining the in-store retail experience -- as a service -- and re-tooling it to offer similar features to eCommerce. According to the latest worldwide market study by Juniper Research, retail spending at new frictionless payment stores -- such as Amazon Go -- will increase from an estimated $253 million in 2018 to over $45 billion by 2023. Juniper analysts forecast that most of these consumer transactions to be within convenience and general stores, with an average transaction value of around $30 per visit throughout the forecast period. The new study also found that self-scanning apps, an alternative to ‘Just Walk Out’ technologies, will be used by over 32 million shoppers by 2023 -- driving higher consumer engagement. 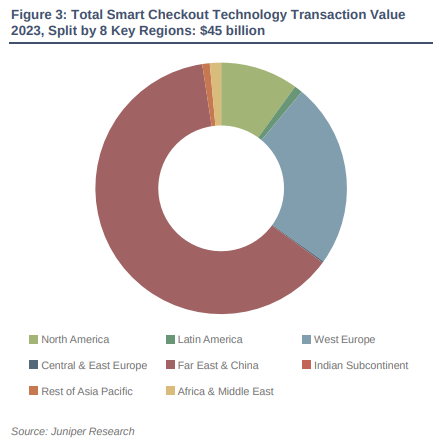 While Wi-Fi will continue to remain the biggest engagement point for in-store customers, Juniper expects smart checkout software apps to act as gateways to technologies like Bluetooth beacons and mobile augmented reality. Furthermore, the development of virtualized beacons, where an antenna array simulates the presence of multiple beacons within a retail store, will increase revenues for beacon manufacturers. These virtualized beacon revenues will grow at an average annual rate of 49 percent, reaching over $1.5 billion by 2023. As a result, physical beacon shipments will grow at 21.5 percent per year. The research found customer service capabilities as a key area for in-store innovation, with retailers experimenting with automated handling of customer service inquiries. According to the Juniper assessment, voice assistants (chatbots) and in-store robots will support this in 2023, with robots generating over $20 million in revenue for their manufacturers. "Many of these technologies can bring multiple benefits to retailers," said James Moar, senior analyst at Juniper Research. "For example, robots and RFID can be used in both customer service and inventory management, making both elements of in-store retail more efficient."